When I was at WYUR in the early 80’s I never imagined that I would have made radio and the Jewish world the focus of my professional life and it certainly would not have gone in that direction without the seedling planted in a studio at 183rd St and Amsterdam Avenue In a building that today is a parking lot and which frankly looks a lot better today than it did back then. I thank President Joel, Rabbi Brander, Mindy & Ira Mitzner and the Mitzner Family and the coordinators of this conference who have made this a very special event for me and my family over the last two years. I am thrilled that Staci Segal, my wonderful wife, whose only flaw is that she never attended a Yeshiva University school, is here today. For almost 25 years She has done with me what many leaders at this conference have recommended. And that is if you know a young member of our community with the potential to make positive change among our people let them do it. Encourage them. Guide them and shape them while letting their potential and commitment make a difference. You know this is not the first time I have been asked by Yeshiva University to speak at a breakfast on a Sunday morning. Back in the 80’s a sweet man from the Dept of Development – who many of you may remember- Rabbi Jakansky (sic)- asked me to travel with him to various synagogues in tri state area and speak at YU Sunday morning breakfasts. Rabbi Jakansky (sic)- who was about half my size- and I would go to Central NJ, southern Connecticut, The Bronx and a variety of other communities to spread the word about Yeshiva. First the large College senior would get up and talk about the virtues of YU and then the short distinguished Rabbi would get up and talk about the virtues of SUPPORTING YU (very similar to the format here). Already as a student I was given the platform to verbally express the importance of Yeshiva in my life. And I did it with pride. Today when asked to sum up what we are taking away from this weekend I again stand on behalf of YU on a Sunday morning with great pride. Great pride that so many of my colleagues in our unique Jewish radio industry – including Mayer Fertig and Miriam l Wallach – and many others on my staff and many associates have roots in Yeshiva University and live and work its ideals daily. How can one not be proud of being associated with this gathering? Reflection during year 7 gives us the chance to remember our accomplishments, to reflect on the change that was brought about by the YU community. To reflect on how much would have been left undone if our leaders and younger leaders would not have gotten involved. The opportunity to reflect has given all of us a sense of satisfaction that is so necessary when moving forward. Milestones have a way of playing that important role. It is reflection on a job well done that springboards us to further involvement and please GD further success. Being here together with all of you has been an amazing way to reconnect to those days on the Yeshiva College campus. It has been a great way to reconnect with the big picture, to recall the message that dominated the ideals of campus life. At a student leadership meeting with Rabbi Lamm in 1984 the president was bombarded with questions about important issues regarding campus life. The long lines at the registrar’s office, the slow elevators in Belfer Hall and why certain items were or were not sold in the cafeteria. When my turn came I felt sympathetic to Rabbi Lamm so I changed the focus of the questioning. Months away from commencement I asked “Mr President, WHAT DO YOU EXPECT FROM THE YU GRADUATE? He enthusiastically enumerated a list that would be very familiar to this gathering. He said: “I want men and women leaving Yeshiva who have a commitment to Torah, Family, TheJjewish world and Israel. Under President Joel that list has been reaffirmed, renewed and reshaped. How can we not marvel at the projects and places that have been undertaken and influenced by the current YU students. Staci and I have experienced this first hand as our son Binyamin arrived on campus last semester and seems to have developed a nonstop desire to get involved and leave his mark. 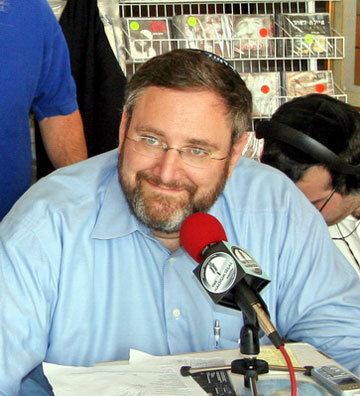 When Rabbi Brander visits my studio the on air conversation is dominated by tales of students in far flung and not so far flung areas who are utilizing the same messages we internalized at Yeshiva and are using them to build projects and build lives. Now, thirty years later, as a result of this annual gathering, I and so many other alumni and caring non alumni are able to pursue the same type of goals and pursue them under the YU umbrella with Yeshiva at our side with priceless individuals and incredible resources providedfgor us That is what I leave Champions Gate with, with guidance that has brought me home again with a great past a dedicated present and a hopeful future. Today at this Sunday morning breakfast I stand at the end of Champions Gate and thank you for the work, the ingenuity, the reflection and the progress that we experienced here and that continues to fuel the hope of the jewish people.